For over a year, I had heard my sister-in-law talk about a truffle shop in her neighborhood that she absolutely loved. Following her on social media, I saw pictures of these amazing truffles in so many incredible flavors that it would make my mouth water. 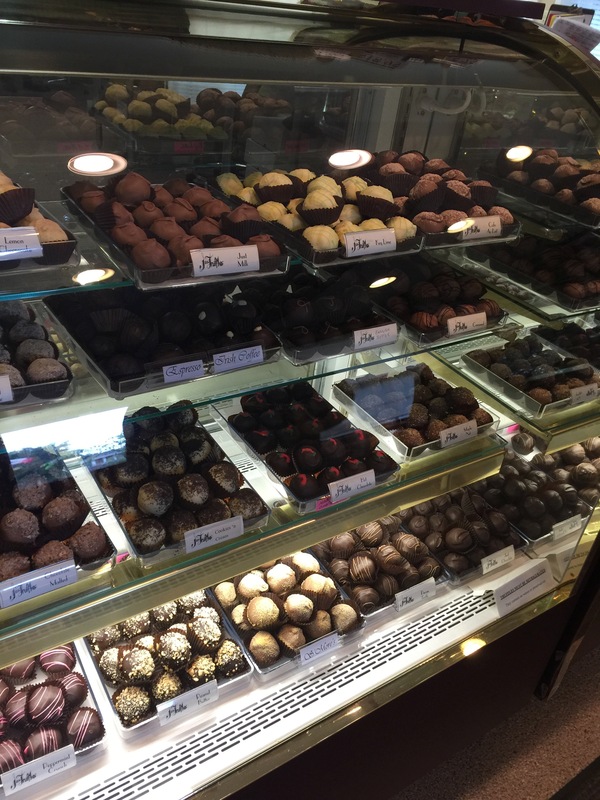 My sister-in-law and her husband would often buy each other gift boxes of truffles for special occasions, and I told my sister-in-law that the next time I was in Saint Paul, I wanted her to take me to this truffle place because I had to get my fingers on some of them. Who can say no to chocolate truffles? When it comes to chocolate, I would never say no. 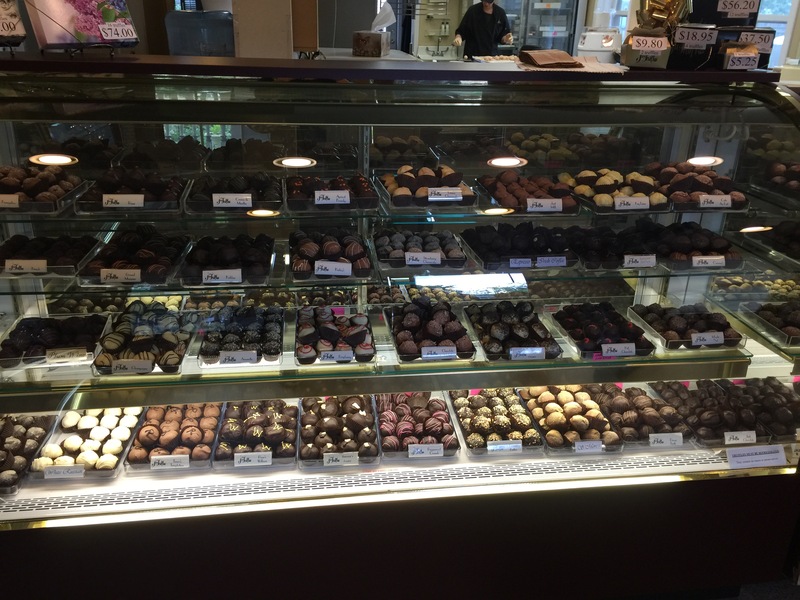 So, when we finally made it to Saint Paul, I told my sister-in-law that we really had to have some truffles. 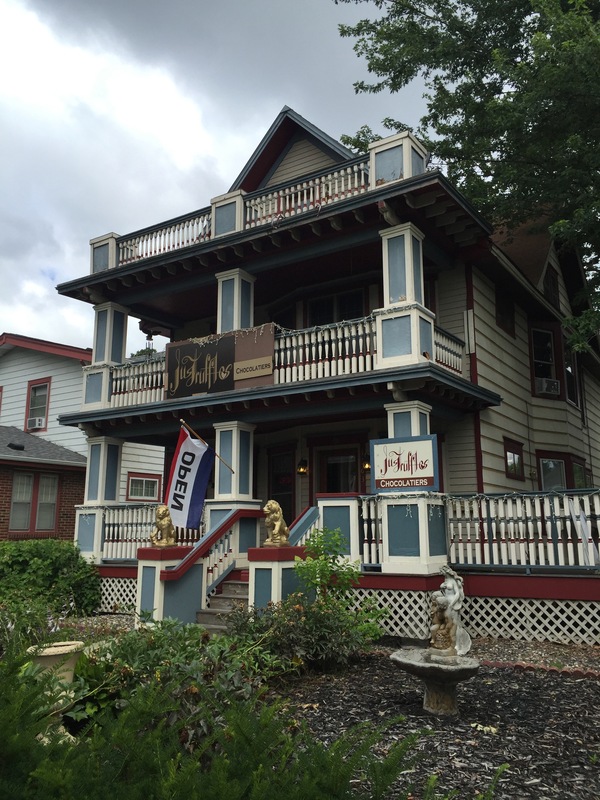 Just Truffles, often referred to as the best piece of chocolate you’ll ever bite into, today operates out of a wonderful Victorian house located on Saint Paul’s prestigious Grand Avenue. The house is not just the storefront for the truffles, but the kitchen where the truffles are produced daily and hand dipped and decorated. 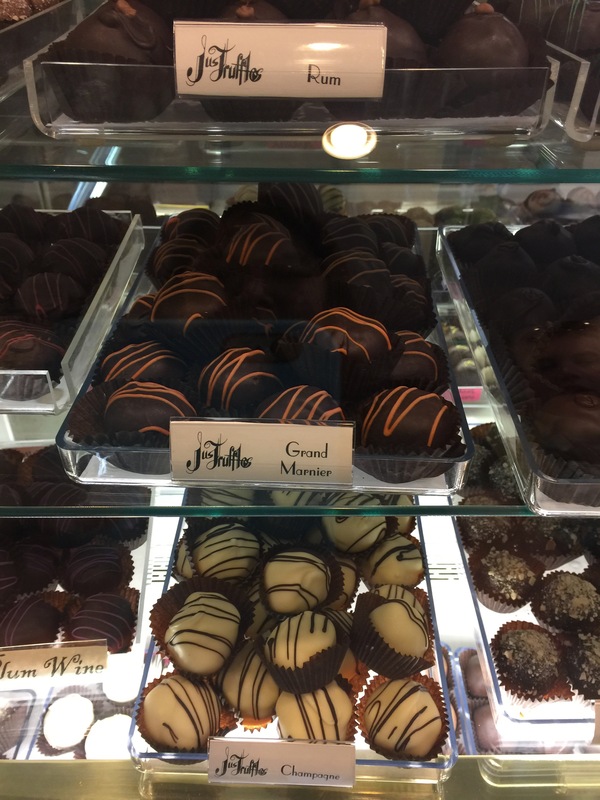 The truffles are made in small batches without the use of fancy equipment, just skilled chocolatiers using a recipe perfected by owners Roger and Kathleen Johnson. 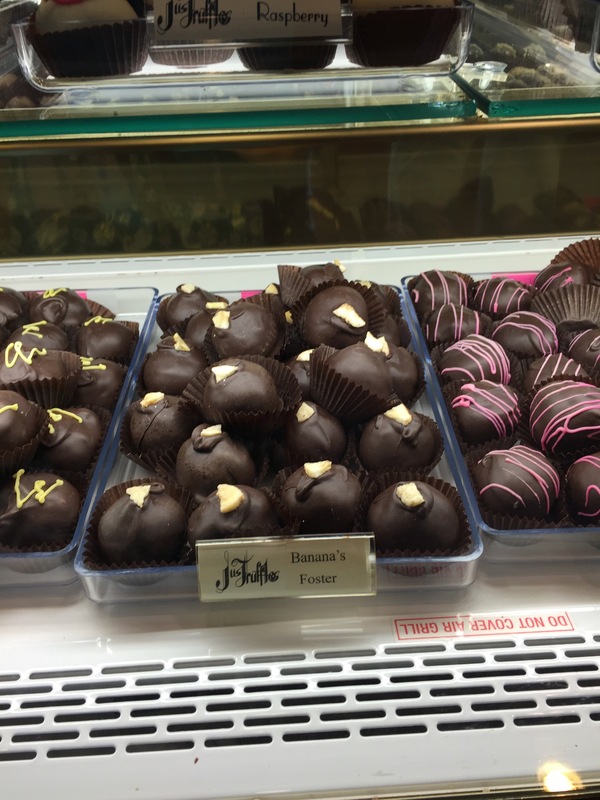 When you walk in the front door, you an often see chocolatiers in the back kitchen hand decorating and crafting the amazing truffles that are then brought fresh to the display case in the storefront. Just Truffles produces more than 25 different inventive and creative flavors of chocolate truffles which include truffles made with fruits, liqueurs and other creative sweet treats. 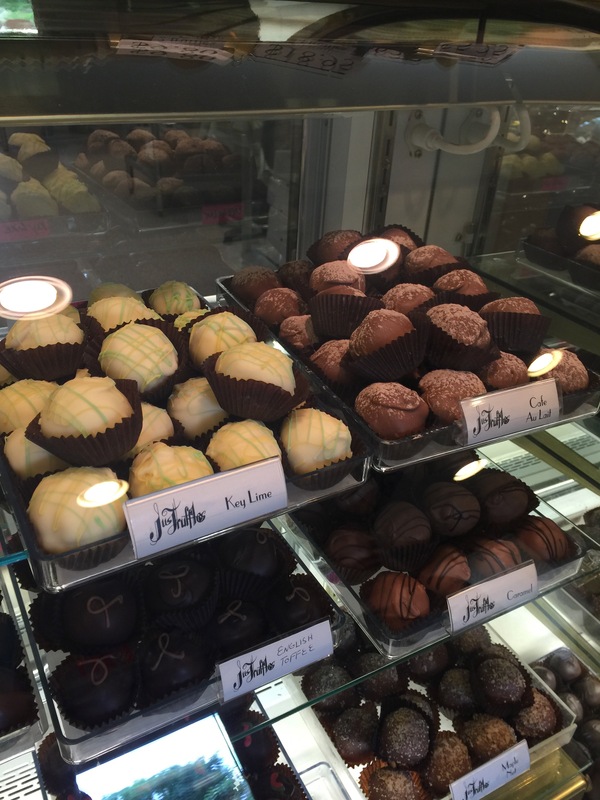 After having served many a celebrity chocolate truffles out of their small shop inside the lobby of the Saint Paul Hotel, the decision was made to expand the chocolate truffles into their own full blown business with this brand new location on Grand Avenue. Today, people come from near and far in the Twin Cities area just to get their hands on some of these amazing truffle creations. 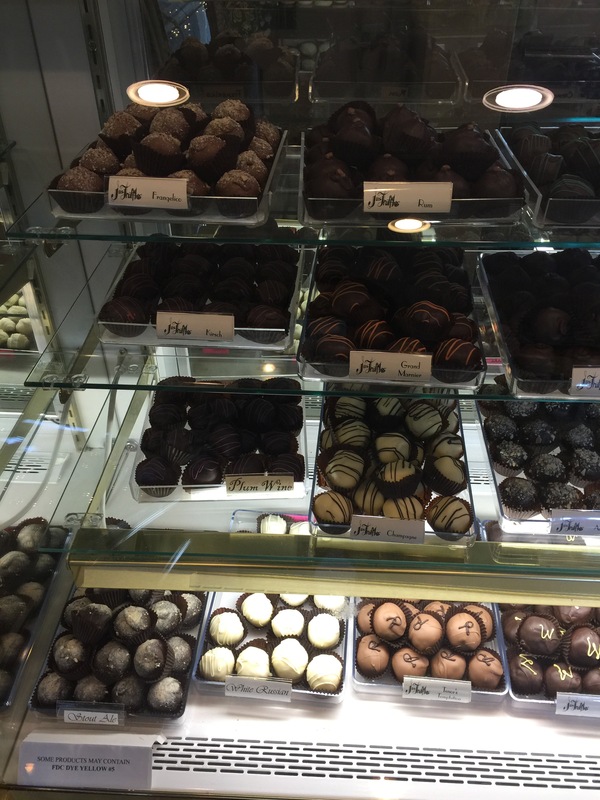 When you step into the store, you’re overwhelmed with the display cases in front of you packed with amazing looking handmade truffles. There are so many different flavors to choose from, that come decorated in all different colors and designs and textures, it’s hard to know where to start. There are truffles mixed with nuts, with fruits, with different kinds of chocolates, with liqueurs, they are all so tempting. 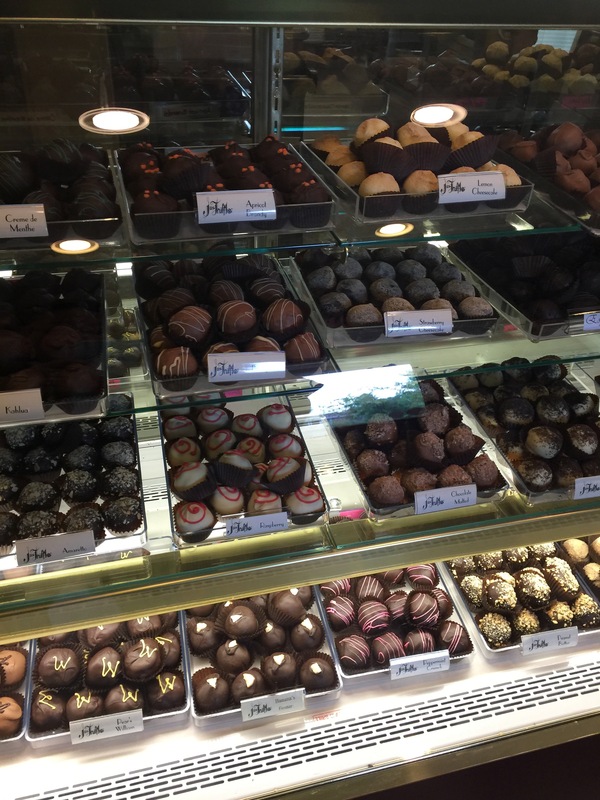 Not to mention the fact that the minute you step through the door, it all smells so amazing, as the aroma of the chocolate from the kitchen just bombards your senses as you can watch the chocolatiers making fresh truffles by hand in the kitchen. So, let’s explore some of the different truffle flavors available on the day I visited Just Truffles with my husband and my sister-in-law. For those that like their truffles to be a little boozy, Just Truffles is right up your alley as they have a whole line of truffles mixed with various liqueurs. The frangelico truffle is made with a combination of frangelico liqueur, crushed hazelnuts, and milk chocolate blended together and then covered with milk chocolate and more crushed hazelnuts. One of my sister-in-law’s favorite flavors is the kirsch truffle made with cherries, cherry liqueur and dark chocolate ganache all dipped in dark chocolate. Plum wine truffles are made with milk chocolate combined with Japanese plum wine and then covered in bittersweet chocolate which is then decorated with a beautiful swirl of pink chocolate design. The bubbly taste of the champagne truffle is quite popular as it combines the flavors of Brut champagne with white chocolate, all of it is covered in more white chocolate with a design accent of bittersweet chocolate. A very interesting truffle was the stout ale truffle made with dark chocolate ganache mixed with a stout lager and then rolled in crushed pretzels. There’s the intriguing White Russian made with white chocolate ganache combined with vodka and Kahlua and then covered in white chocolate. The apricot brandy truffle is made with ground apricots with the addition of apricot liqueur all whipped into dark chocolate ganache and then covered in dark chocolate. Kahlua truffles are made by combining coffee liqueur with milk chocolate ganache and then covered in dark chocolate and topped with an espresso bean. If you want a combination of white and milk chocolate, try the Bailey’s Irish Cream truffle where the liqueur is combined with the two chocolates and then covered in milk chocolate. Other liqueur flavors included Irish Coffee made with coffee and Irish Whiskey, Amaretto made with crushed almonds, Pears William combining pear liqueur with white and dark chocolates, and Rum with Bacardi rum and dark chocolate. Then there’s the signature truffle made in honor of tenor Luciano Pavarotti who loved Just Truffles when he sampled them on a visit to Minnesota. Combining some of his favorite flavors, the Tenor’s Temptation truffle was created with milk chocolate, cream of coconut and Malibu rum all covered in milk chocolate. If liqueur flavored truffles are not to your liking, there’s a whole selection of nut-inspired and fruit infused truffles. Tart raspberries and raspberry flavoring is mixed with bittersweet chocolate and then covered with white chocolate produces the Raspberry truffle. Lemon Cheesecake truffle is made with lemon juice, lemon rinds and cream cheese all combined with white chocolate and then rolled in crushed graham crackers. Similarly, Strawberry Cheesecake truffle is made using cream cheese mixed with bittersweet chocolate and strawberry flavoring covered in bittersweet chocolate and also rolled in crushed graham crackers. Continuing with the graham cracker theme, there’s the S’mores truffle made with a combination of chocolate, marshmallow creme and crushed graham crackers. If you’re looking for something a little spicy, there’s the “Hot” Chocolate truffle made with dark, bittersweet chocolate infused with spicy habanero peppers and then covered in dark chocolate and decorated with a pepper-shaped accent. Too spicy? What about a Pecan Turtle truffle made with milk chocolate caramel truffle covering a piece of chewy caramel and pecan all dipped in dark chocolate. A Carmel truffle is made with caramel fudge sauce mixed with milk chocolate ganache and covered with milk chocolate. There’s the Maple Nut truffle made with milk chocolate mixed with crushed walnuts and maple syrup covered in dark chocolate and rolled in more crushed walnuts. Creamy Peanut Butter truffles are made by combining white chocolate ganache and creamy peanut butter all dipped in dark chocolate and covered in crushed peanuts. The Chocolate Malted truffle is made with malt powder mixed with heavy gourmet whipping cream folded into a milk chocolate center and covered with milk chocolate. And what about a pick-me-up with the Espresso truffle made with dark chocolate ganache mixed with heavy rich espresso flavor finished with dark chocolate. 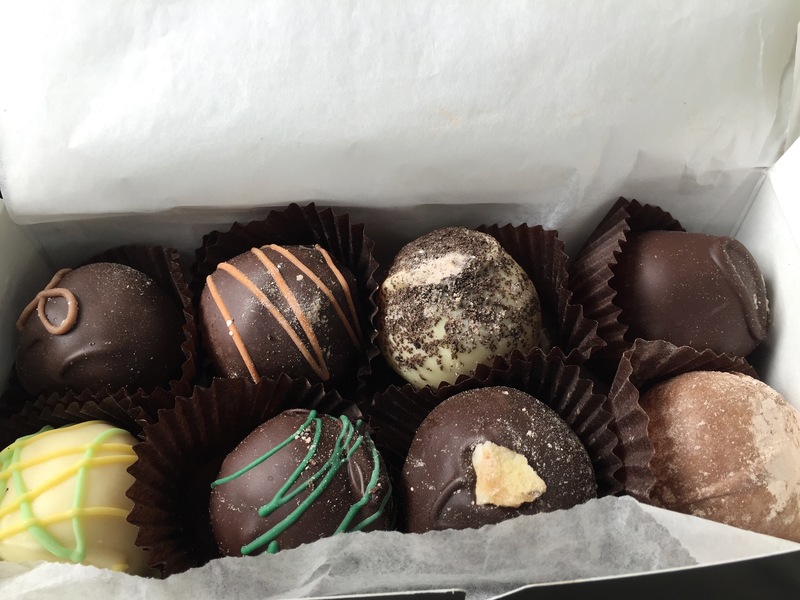 After looking through all of the flavors, my husband and I chose to order a box of 8 truffles. We decided that we’d each choose 4 flavors of our own. After we made our choices, the lady behind the counter boxed up our 8 truffles into this beautiful, stylish box. As all of the truffles are handmade daily and without preservatives and without wax, this means that the truffles won’t hold too long and should be eaten fresh and at room temperature. 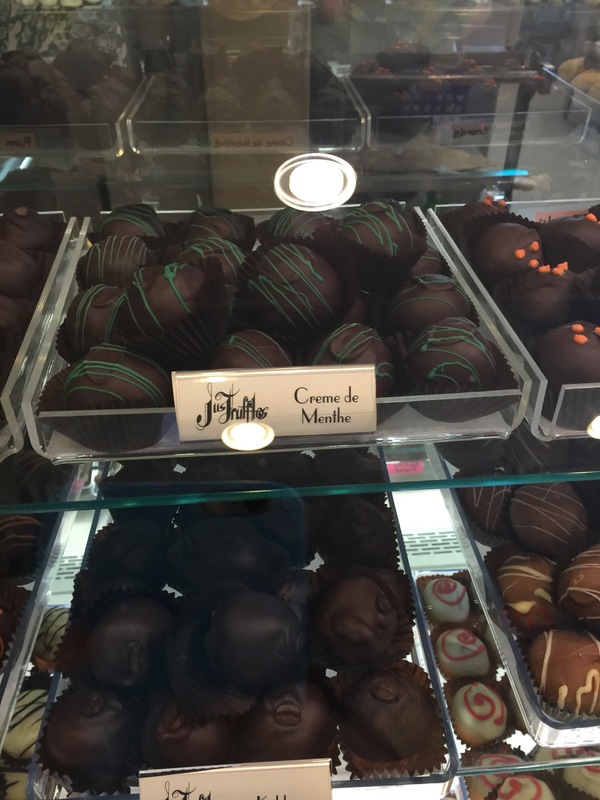 For my husband’s four truffle choices, he decided to order two of the liqueur infused truffles; Grand Marnier and Creme de Menthe. My husband loved the mint flavor of the Creme de Menthe. His first remark was that the Creme de Menthe tasted just like an Andes candy with that lovely mix of mint flavor and chocolate combined together. The Creme de Menthe is made with dark chocolate truffle laced with creme de menthe and enrobed in dark chocolate. With the Grand Marnier, Just Truffles makes theirs with orange rind and grand mariner combined together in a dark chocolate ganache and then covered in dark chocolate. For my husband, he really liked the combination of the orange and the liqueur together, but he’s always been a fan of the subtle orange flavor. Ultimately, he said he liked the Grand Marnier truffle more than he liked the Creme de Menthe truffle. 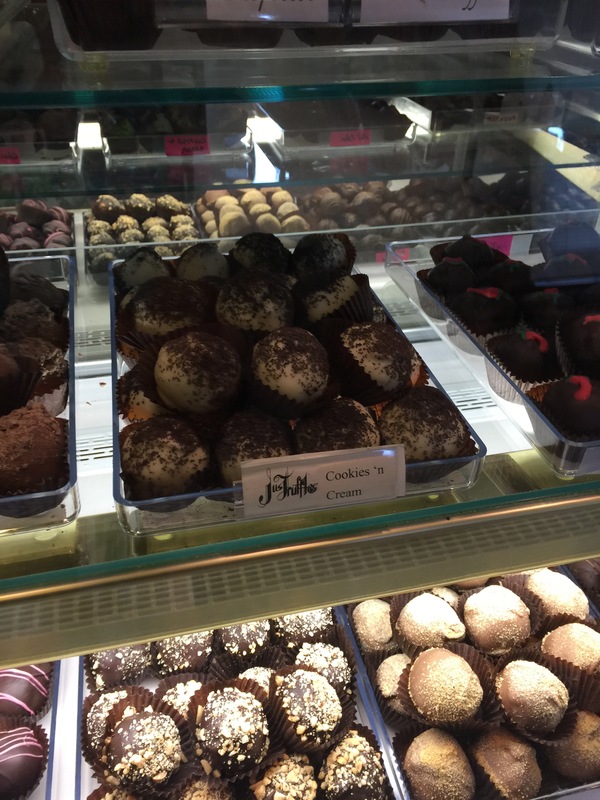 Two of my four truffle choices included the Cookies and Cream truffle and the Cafe Au Lait. The Cookies and Cream is made by combining cream and chocolate cookie pieces together with white chocolate and then rolling it in chocolate cookie crumbles. This particular truffle was extremely sweet due to the combination of the cream and the white chocolate, two incredibly sweet ingredients combined together. The crunchy texture from the chocolate cookie crumble was a good balance in texture to the sweet filling of the truffle. This literally tasted like I was eating an Oreo cookie in truffle form. Just Truffles says that the Cafe Au Lait truffle was the winner of the best truffle sold in the Twin Cities award. It is made with coffee and cream whipped into a combination of white and milk chocolate and then covered in milk chocolate. It certainly tasted like taking a shot of creamy coffee in a one bite truffle. It was creamy and silky and smooth, much the way that chocolate silk as a pie filling feels like. One bite into the truffle and you could really taste the smooth coffee flavor. I enjoyed the Cafe Au Lait more than the Cookies and Cream. My husband’s other two truffle choices were the Key Lime and the English Toffee. The Key Lime truffle is made with key lime juice direct from the Florida Keys mixed with white chocolate. My husband really enjoyed this truffle because it was a little sour and a little tart, exactly the way it should be. The fact that Just Truffles actually used key lime juice rather than just picking up local limes and juicing them made all the difference in the world in the flavor of the truffle. The truffle just tasted authentic and refreshing. The English Toffee truffle is made using a mixture of chocolate, almonds and rich buttery toffee combined together and then rolled in crushed almonds. Out of the four truffles that my husband chose, he said that this one, which he expected to be the most plain was actually the truffle he enjoyed the most because the taste was just so unexpectedly good. The truffle was rich and creamy and ultra luxurious. The flavor of the buttery toffee really shined through and the combination with the crunch of the crushed almonds was a perfect mixture. His comment was that he’d go back to Just Truffles just to get a box of English Toffee truffle. My final two truffles were the Bananas Foster and the Just Chocolate. The Just Chocolate truffle is Just Truffles signature and most popular truffle. Made with dark chocolate ganache, dipped and decorated in dark chocolate, this truffle is the ultimate bittersweet chocolate truffle, as they describe it. 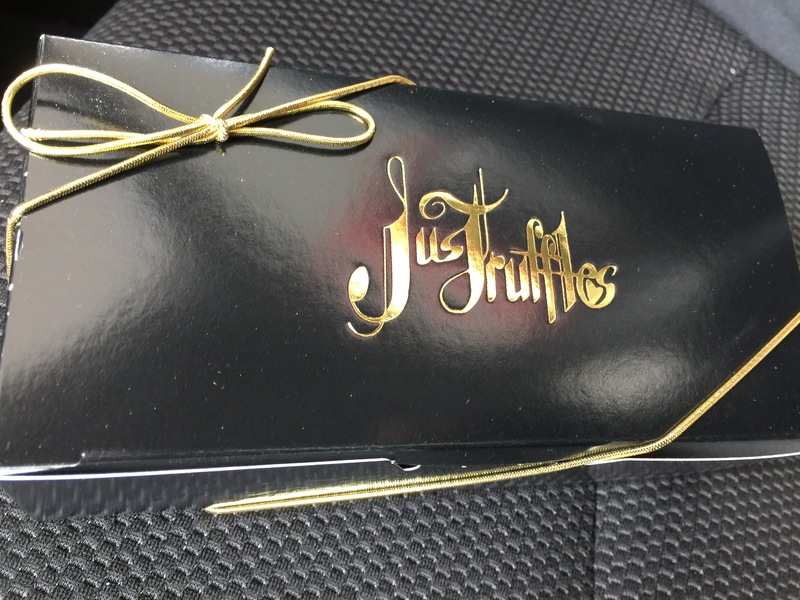 If you are a chocolate fan, and who isn’t one if you’re shopping at Just Truffles, then the Just Chocolate is a must try item as its dark chocolate on to of dark chocolate mixed with even more dark chocolate, essentially a chocolate lover’s dream. The truffle tasted exactly as advertised. The rich bittersweet chocolate flavor was amazing and explosive the minute you bite into the truffle. It’s obvious why the Just Chocolate is Just Truffles’ most popular flavor. I would definitely go back for more of this particular truffle. But out of all of the truffles I tasted, by far and away, the one that was the most amazing was the Bananas Foster truffle. Made with bananas and rum combined with milk and dark chocolate and dipped in dark chocolate, this truffle was out-of-this-world and completely off-the-charts. The caramelized banana flavor that is distinctive of bananas foster, that creamy, luxurious banana flavor really came through in the truffle. For a banana lover like me, this truffle was money. I’ve never tasted a better truffle in my life. If this was the only truffle I’d ever have again in my life, I’d want it to be this bananas foster truffle. After having sampled some of Just Truffles many truffle flavors, I see now why it has the reputation that it does. It’s one thing to make creative, and inventive, truffle flavors, it’s an entirely different thing to make those truffles mouthwateringly good. This is definitely a feat that Just Truffles has been able to create. Both my husband and I found truffle flavors that blew us away by just how good they were. If I lived in Saint Paul, I could see myself making an excuse to stop by all the time to pick up a few truffles. It’s probably a good thing I don’t live that close by, now I have something to look forward to next time we’re in Saint Paul. The Bananas Foster truffle and Kahlua Truffle descriptions had my mouth WATERING!! And those pictures…….. I am supremely jealous.